About You: i love bands, anime, pasta, mysteries, the walking dead, league of legends, travelling , road trips, music. Hobbies/Interest: Bass, guitars, internet, netflix, Japan, surfing and baseball. Other Artist/s you like beside SCANDAL: All Time Low, Fall Out Boy, Pierce The Veil, A Day To Remember, Nirvana, Mayday Parade. Favorite Movies / TV Shows: Movies ; The Count of Monte Cristo, TV Shows ; currently Daredevil, The Walking Dead and anime. Favorite Books: Any John Grisham and James Patterson books. Dislikes: people who are too full of themselves. Favorite Qoute(s): Dream as if you'll live forever and live as if you'll die today, in short YOLO. People I'd like to meet: Scandal and all of my other favorite bands, athletes and actors. Hobbies/Interests: Drawing, writing fanfics, editing. Favourite Movies/TV Show: Running Man, Weekly Idol, We Got Married, etc..
Favourite quote(s): "정직은 아주 비싼 선물이어서 싸구려 인생들로부터는 기대하지 않는 편이 좋다." "Honesty is a very expensive gift; don't expect it from cheap people." About You: I'm a 17-year-old kid with autism who loves spending his time with films and music. And a self-confessed Japan enthusiast. Dislikes: Nothing really - except a bad flick. Place and DOB: Canada, June 4 1992. Fav. Color: White/Black when it comes to clothes. I like red/purple when it comes to bold colours. About you: Long time guitarist and music lover. I cook by day, play music by night in a death metal band. Hobbies and Interests: Anime, K-Pop, Japanese culture, gaming, computers, technology. Other artists you like besides SCANDAL: Children of Bodom, Wintersun, Ensiferum, Cryptopsy, The Black Dahlia Murder, Silent Siren, Shank, Cthonic, Queens of the Stone Age, Opeth, Arsis, Alterbeast, Bloodbath, Havok, Municipal Waste, Testament, In Flames, Lagwagon, Gorod, Obscura, Vesperia, Darkest Hour, SNSD, Crayon Pop, Kara, Orange Caramel, SO MANY. I CAN GO FOR HOURS. Fav. Movies/tv shows: Full Metal Alchemist (anime), The Office, Lion King, Pokemon: The Movie, Digimon: The Movie. Fav. Food: Pork Chops. Pho. Salmon. About You: 18 years old dreaming to be a professional dentist. I'm not good in approaching people but I'm fun to be with. Not so active here but I'm always updated about stuffs regarding to the things I like (SCANDAL, Suzy etc.) Sometimes 4D personality attacks me. About You: I'm a 26yrs old who likes traveling and going out with friends. sometimes alone. i don't eat Cheese and i hate Milk. loves Anime' and Music. Other Artists You Like Besides SCANDAL: Yui, Babymetal, Stereopony, L Arc en ciel, The Gazette, Judy and Mary. Favourite Movies/TV Show: Films: City of Angels. Favourite quote(s): "Life's a Joke, So Keep on Laughing and Smiling"
People I'd like to meet: SCANDAL (especially Tomomi), too many to mention. Favourite Color: blue, black, white, yellow, red. About You: bookworm, simple, j-popper and k-popper, knows how to cook and I love playing badminton. I also love watching anime. Other Artists You Like Besides SCANDAL: Stereopony, YUI, Flow, Aqua Timez, OOR, Miwa, silent siren, and many more! Favourite Books: Dan Brown books, Harry Potter complete book series, John Greene books and many more! People I'd like to meet: SCANDAL, stereopony, YUI, Flow, Aqua Timez, OOR, Miwa, silent siren, and many more! About me: My loves are music and honesty. I like to play the guitar. 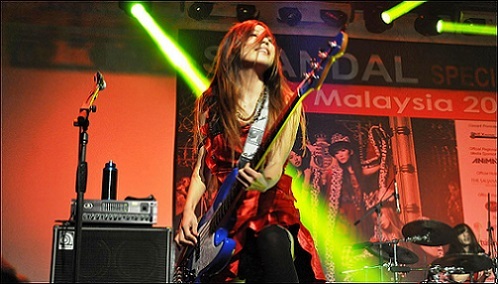 I have an electric guitar (Epiphone, Les Paul) a semi acoustic and a few years ago I bought a bass guitar after I fell in love with Tomomi (lol). My array of music is large and diverse. For years I could not find any songs that made me feel anything, then I stumbled on Japanese music, it made me happy. The first band I discovered was One OK Rock, then (thank all the Gods) I found Scandal, the rest is history. Favourite music: I don't have a favourite music genre. I have favourite music "at the moment." At the moment it is definately J-Pop/Rock. For years I have loved Hard Rock, Metal, Punk Rock, Acoustic, Classical and the unusual and different. Anything that invokes an emotion in me. Favourite Movies: I'm bit of a syfy fan so basically the big syfy/fantasy movies Star Wars, Alien, Harry Potter, The fifth Element etc. Favourite quote: I always wanted to be a procrastinator but I never got around to it. About You: Disconnected. Lover of japanese culture and music (jpop/jrock) Producer of electronic and experimental music. Favorite Books: Fantasy/sci fi Books / dan brown type stories. Dislikes: haters / players/ posers / the ignorant. Favorite quote(s): I reject your reality and substitute my own. Favourite quote(s): "Be yourself; everyone else is already taken."